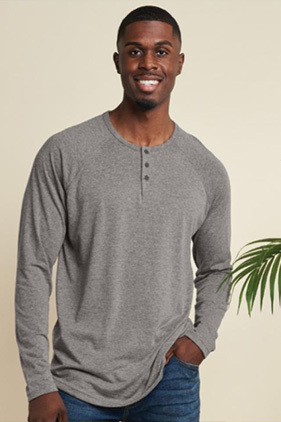 50% polyester/25% combed ring-spun cotton/25% rayon, 32 singles, 4.3 ounce tri-blend long sleeve jersey henley. Heathered colors with a vintage look. Side seamed. Dyed to match buttons, 3 button placket. Raglan sleeves, hemmed. Tear away label.